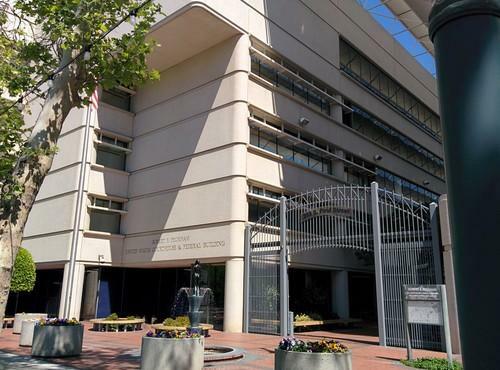 There's a new sign on the door to Courtroom 5 at the federal courthouse in San Jose, the home to the Apple v. Samsung battle that's playing out this month: "Please turn off all cell phones." For a trial that centers on smartphones and the technology they use, it's more than a little ironic. The entire case might not even be taking place if the market wasn't so big and important, but the constant need for connectivity of everyone is causing problems in the court, hence the new sign. The problems have centered on the system that displays the court reporter's real-time transcription onto monitors on the desks of Judge Lucy Koh, the presiding judge in the case, and the lawyers of Apple and Samsung. The system, it seems, is connected via Wi-Fi and that connection keeps failing. "We have a problem," Judge Koh told the courtroom on April 4, soon after the problem first appeared. Without the system, Koh said she couldn't do her job, so if people didn't shut off electronics, she might have to ban them from the courtroom. In many other courts, electronic devices are routinely banned, but the Northern District of California and Judge Koh have embraced technology more than most. While reporters and spectators are limited to a pen and paper in courts across the country, the court here permits live coverage through laptops and even provides a free Wi-Fi network. On Monday, the problems continued and Judge Koh again asked for all cellphones to be switched off. But not everyone listened. A scan of the courtroom revealed at least one hotspot hadn't been switched off: It was an SK Telecom roaming device from South Korea, likely used by a member of Samsung's team. The hotspot was switched off by the end of the day, but on Tuesday there were more problems. "You. Ma'am. You in the front row," Judge Koh said sternly during a break. She'd spotted an Apple staffer using her phone and made the culprit stand, give her name and verbally agree not to use the handset again in court. As a result of all the problems, lawyers for Apple and Samsung jointly suggested using a scheduled two-day break in the case to hardwire the transcription computers to the court's network. It's not clear if that happened, but the system problems remained on Friday, hence the new sign and an announcement from the clerk to switch phones off, "not even airplane mode." The transcription screens failed at 9:09 a.m., just minutes into the first session of the morning.